The prevalence of HIV in Rakai district is estimated at 12.7%, which is approximately double the national prevalence. It is well established that HIV and AIDS affect nutritional status and food security of populations. 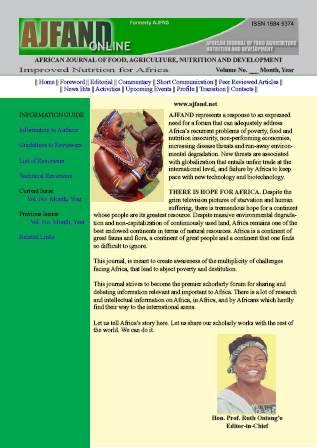 The aim of this study was to assess the food and nutrition security of people living with HIV (PLHIV) and the potential of banana nutrient enhancement to improve nutrient intake. A total of 173 PLHIV registered with Rakai Health Science Project were chosen and interviewed using structured questionnaires to determine the current contribution of banana to the household food security. Nutrient intake data were collected using Gibson's 24-hour recall method and food frequency questionnaires. Key informants' interviews with agricultural extension staff and focus group discussions with PLHIV and support group personnel were used to collect qualitative and quantitative information. Experiments were conducted to determine the suitability of banana as a food vehicle to boost the energy and nutrient intake of PLHIV. A product was made by blending banana flour with soybean flour and multi-nutrient fortificant premix. The formulation was reached using the Pearson's square method, with a target protein content of 15%. To pilot test the product, the nutrient-enhanced banana powder was distributed to15 PLHIV and data on acceptability and the contribution of the product to nutrient intake were assessed. It was found that the majority of PLHIV (88%) in Rakai district consumed banana at least 3 times a week. The baseline daily intake was found to be 1676.2 kcal, 0.8mg, 0.8 mg, 249.6 mcg, 259.4 mg and 12.9 mg for energy, vitamin B1, vitamin B2, folate, calcium and iron respectively, which was below the recommended daily allowances (RDA) for PLHIV. The formulated banana product was found to supply 459.7 kcal and contained 15% protein. The product was well accepted by the PLHIV and its average level of consumption was 67 g per day. At this intake level of the product, study households intake of energy, vitamin B2, folate and calcium increased to 1732.89kcal, 1.09mg, 277.8mcg and 300.79mg respectively while iron and vitamin B1 intakes were not significantly different from the baseline values. It can be concluded that supplementation of diet of PLHIV in Rakai with nutrient-enhanced flour can raise nutrient intake of PLHIV to recommended levels for improved nutritional and health status.